My sister, “Polka Dot” just wrote about her stay with us on her lovely blog. Take a look to get a little peek into our lives! Great picture! Her expression is priceless. Stopping by from 5 Minutes for Mom. She’s so adorable and her hair looks like a sea urchin. I had my baby but he’s a boy and I always set to it that his hair gets trim before it grows long and unbearable for him. Kids are really adorable and look so cute even if there are not at their best. good thing you had it in braids, thats a mess to try and brush out later. Love it! 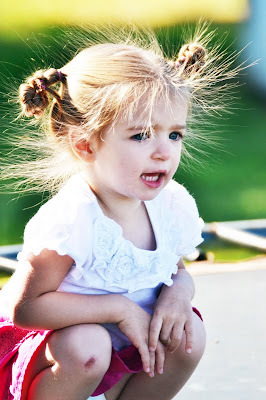 My daughters hair looks like this every morning for preschool drop off in the winter. It literally sticks to her car seat.